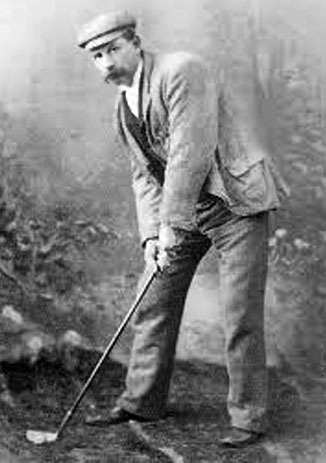 Yet another native of Musselburgh (born 1862), he learned the game as caddie to triple Open Champion Bob Ferguson. Willie was runner-up in the Open of 1886. The following year he was assistant to Charles Hunter at Prestwick, finishing third in the Open there with a disastrous 9 after finding a bunker on the 16th. Harold Hilton recounts entering Charlie Hunter’s shop after the tournament and seeing two upturned buckets. On one sat Campbell, on the other his caddy, both weeping bitterly. He spent some time as a professional at North Berwick but moved to Bridge of Weir in Renfrewshire and Ranfurly Castle where he laid out the nine-hole course. During his time here he also designed Cowal, Largs and Rothesay on the Clyde estuary and the magnificent island links at Machrie. He emigrated to the United States in 1894 and continued to make clubs there while serving as pro at the Brookline Country Club in Massachusetts. He was runner-up in the first unofficial US Open to Willie Dunn. In 1896 he moved to the Myopia Hunt Club and was put in charge of Boston’s public links at Franklin Park the following year. Despite his near misses in the Opens, he was possibly the greatest match player of his time trouncing all the other great names (Willie Park, Bob Martin, Willie Fernie, Archie Simpson and Davie Brown) in contests for large purses. His wife, Georgina, was the first ladies' professional in the USA at Franklin Park in Boston. He died in 1900 aged only 38.